This title is obviously sung to the tune of Total Eclipse of the Heart. Well, glad that song is now in your heads... Tonight there was a partial eclipse over SoCal. 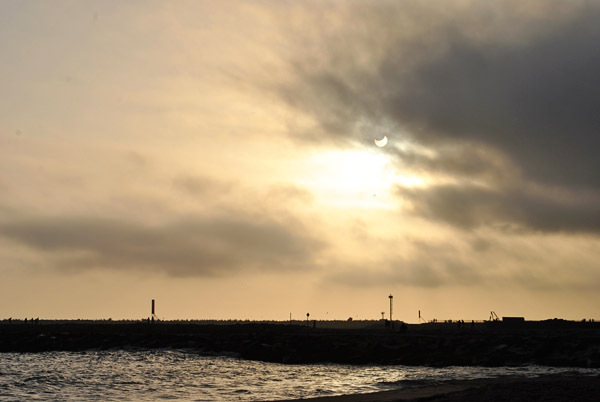 I was on the beach for a 9 mile run, and half of my run was spent staring at an eclipse (you know, that thing you're not supposed to do), luckily it was cloudy. T was at our picnic setup taking pictures after his shorter run (still recovering from an injury) because we got a late start running. Here's a picture I took after my run, which was towards the end of the eclipse. And here is the very first gif I've ever made, it uses some of the pictures that T took of the eclipse. Gifs are fun, and totally easy. 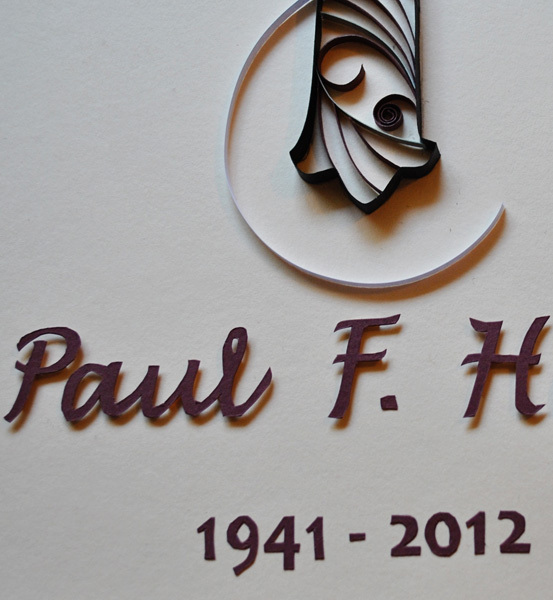 My cousins' Opa (grandpa) passed away recently, and their family collects crosses, so I made a memorial cross for them. He was a deacon and the family were all Texas Aggies, so a cross done in maroon seemed an appropriate way for the family to have a reminder of him and his warmth. I drafted the cross onto the paper and then just went with my gut for the fill and flourishes. I even did some intersecting lines for the interior, that was new to me. I printed the text out and free-handed some details and connected some letters until I liked it, then I cut it out with my x-acto knife and raised it off of the paper for a shadow effect. I simply cut very thin strips of the ivory paper (about 1/16") and glued it to the back to stand the text up off of the paper. The dates were simply glued to the paper. 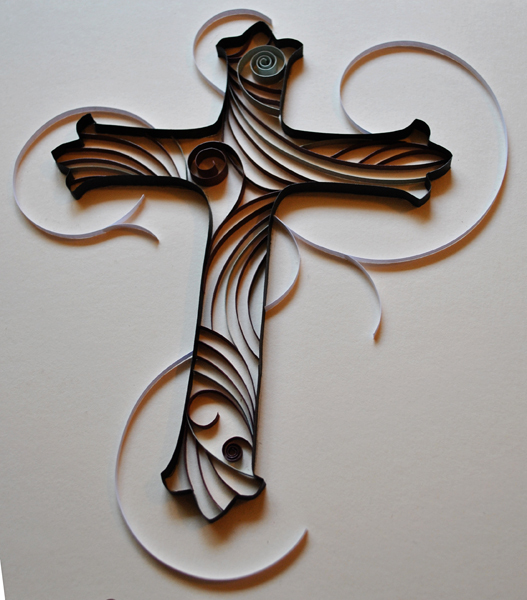 I made my own quilling paper for this project; the outline of the cross is done in 1/4" thick strips of black construction paper and the colored paper is 1/8" and 1/4" thick strips of Canson Mi Teintes paper in maroon, and a bluish grey. 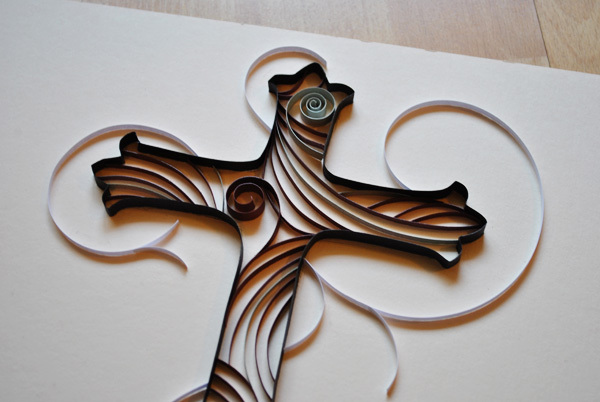 The white is pre-cut quilling strips. The background is an ivory Canson paper, it's thicker than the Mi Teintes, but I don't remember what it's called. I then framed it and sent it off, but I'm still behind on the learning curve for the framing part. Any quillers out there have tips on where to get decent quality frames?